Yesterday was the feast day of St. Francis of Assisi. I chose him as my confirmation saint a long, long time ago. 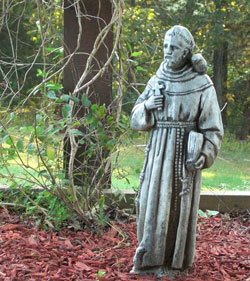 The picture is the statue of St. Francis under the deck to my house. I can look out my office door to see him when I need some inspiration. Francis of Assisi (Giovanni Francesco Bernardone; born 1181/1182 â€“ October 3, 1226) was a friar and the founder of the Order of Friars Minor, more commonly known as the Franciscans. He is known as the patron saint of animals, the environment and Italy. This is the path which Francis points out to us, the path which he also travelled, because it was that chosen by the Son of God in order to become man. Christ Jesus, though â€œHis state was divine, yet he did not cling to his equality with God, but emptied himself to assume the condition of a slave, and became as men areâ€ (Phil 2,6f). This unlimited love of God for humanity, which led Him to strip Himself of His divinity in order to participate in the fate of man, even to die naked on the cross for us, is the love which Francis sought to live throughout his existence, up to the final instant when, right here, he wished to die, like his Lord, naked on the ground. Francis made himself little because he wished to imitate his Lord, who, to love him, had become so little as to be born as a defenceless child from the womb of the Virgin. You can learn a lot more about St. Francis on this website.